This is the PVC rack I am thinking of making to carry a yak. Well, I got some PVC cut and discovered laying it across the top would dent the roof when the yak is placed on it. I guess I will have to make it elevated. interesting. So the PVC is sort of just to provide a frame for the pool noodles? Do you still have straps going through the the car? Yeah but this elevated idea would be to prevent denting the roof. I haven't gotten as far as the straps. If I added another t-connector in the middle of this design I think it would not bend anymore. 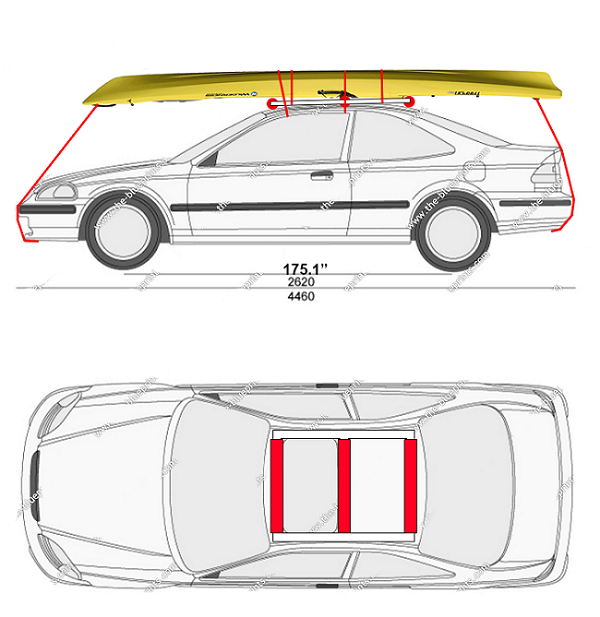 Then I guess I could strap each rack to the yak, then the yak to the car through the window. But I still might go with the original design and just use more flexible PVC so it conforms to the roof curve. Seems like it would be more stable.